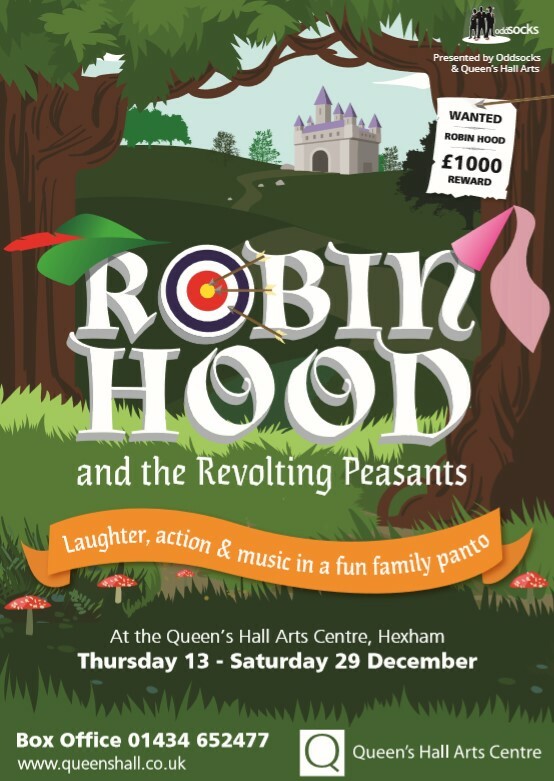 Over 2500 tickets now sold as Oddsocks Productions revolt with Robin this winter at the Queen’s Hall Arts Centre, Hexham with a new, comic adaptation of the legendary Robin Hood. Theatre Company Oddsocks Productions is fast approaching their 30th anniversary year as they prepare to tour the UK from December. The team known for bringing classic tales to life with a difference will be adding their inimitable trademark humour, live music and audience interaction the iconic tale of Robin Hood in Andy Barrow’s brand-new piece “Robin Hood and The Revolting Peasants” at the Queen’s Hall Arts Centre, Hexham this Christmas! The family-run theatre company has been creating innovative and hilarious adaptations of classic texts since 1989 and their latest production promises to be no exception. Robin Hood is one of the most enduring folk legends and the subject of many ballads, books and films. Over the course of seven hundred years, the ‘romantic folklore hero’, ‘depraved outlaw’ and ‘prince of thieves’ has emerged as a versatile classic, tackled by everyone from Howard Pyle to Walt Disney, and even by Kevin Costner at Sycamore Gap!! On why the company has chosen to adapt Robin Hood for their current tour, artistic director and writer of the show Andy Barrow says “We wanted to create a Robin Hood that speaks to a modern audience. We like to produce work for a reason, to have a message, for us. Robin Hood is about empowering people. In a crisis, co-operation and teamwork produces far better results than acting as an individual and if you persist within your efforts, eventually you do make a difference”.